Long gone are the days when the only exterior color choice of a membrane structure was white. This limiting factor did not sit well with the architectural and local building code communities. Today, there are significant advancements in technology that allow virtually any exterior color to be utilized for sports and recreation applications such as colleges and universities, as well as professional sports teams. Combined with attractive glazing walls and graphics, energy-efficient insulation packages make a tension membrane structure a solid long-term choice for sports and recreation applications. The choice of Shelter-Rite architectural fabric is a critical element completing an Engineered Tensioned-Membrane Structure. Top quality components including strong polyester knitted fabric coated with specially formulated fire resistant (FR) PVC make up the membrane material. The fabric is then combined with specific top finishes which enhance its structural qualities. This includes protection from damaging UV rays which extend the life of the membrane, as well as surface qualities that protect the structure from weather conditions (rain, mold, dirt, ice and snow, and the loads associated with these elements). Materials used in the top finish of the fabric membrane range from acrylic to advanced Fluoropolymer, each providing specific levels of appearance and durability. All Shelter-Rite fabrics are available in white and a full range of custom colors. Acrylic finishes offer solar protection, dirt resistance and an economical way of finishing the final structure. 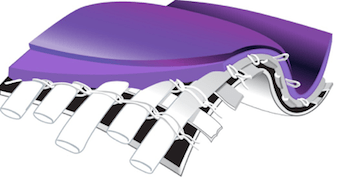 Advanced Fluoropolymer, (a family of films made from PVF and PVDF) delivers the ultimate finish for long-term UV protection, vivid color and a unique surface appearance used in the most distinctive frame structures around the world. Lately, two advanced materials have emerged as the premium top finishes used with Shelter-Rite architectural fabrics:DuPont Tedlar and Arkema Kynar. These top finishes, proudly made in the USA, not only offer superior UV resistance, but deliver superior resistance to dirt, mold and mildew and are virtually maintenance-free. The Kynar Fluoropolymer top finish is available in white, translucent, and a full range of custom colors. It is also applied as a film or a liquid top finish. 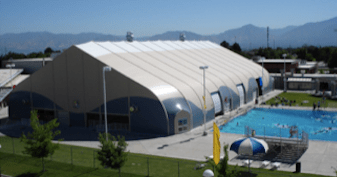 Kearns Oquirrh Park Fitness Center - Kearns, UT: Olympic Sized 50 Meter Pool Enclosure. The latest application of this technology is to offer the Fluoropolymer top finish in a printed application, now offering the possibility of unique and exclusive patterns for one’s facility. This technology is a Seaman Corporation exclusive and available on Shelter-Rite architectural fabrics and Fibertite single-ply roofing membrane. The use of color on the exterior lends design flexibility to blend into the surrounding environment, and offers backgrounds to give the building a unique appearance. Seaman Shelter-Rite architectural fabrics with Fluoropolymer top finishes offer the longest life and highest performance. Membranes with PVF (Tedlar® by DuPont), the industry standard, are set for low maintenance and longevity. The PVF top finish comes in Brite White, available in opaque and non-opaque (low translucent) to offer aesthetic light transmission. PVF in Milky White (non-opaque) offers greater light transmission for a “skylight” effect. When structures need to blend into their environment, PVF is available in 11 different colors/tones for the perfect custom installation: Granite Gray, Sand Stone, Spruce Green, Misty Gray, Dawn Gray, Salem Blue, Concord Cream, High Sky, Highway Green, Bayberry and Desert Sand. The Tedlar film is composed of pure poly-vinyl compound and pigment. This combination of extremely durable compounds delivers consistent long-term performance (dirt release, color retention and enduring surface aesthetics). Structures that combine the elements of high-quality frame components along with advanced materials used in the latest membrane fabrics, provide a full range of design choices for today’s recreational buildings. 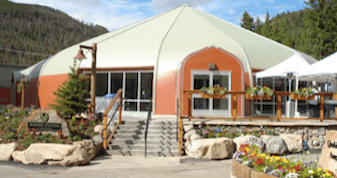 When quality and style cannot be compromised, structures with the Shelter-Rite Tedlar and Kynar top finishes provide the finest, and most durable, yet colorful options to create your perfect building. Do you have any experience with new, colorful membrane options used on today's recreational buildings? Tell us about it in the comments!